Yard drains, also called area drains or landscape drains, are common in yards with significant contours, extensive landscaping, or swimming pools. The drains work much the same way as a floor drain in a garage or basement floor, collecting standing water and channeling it to the street, a storm drain, or other drainage areas. Like any home drain, a yard drain can back up and cause flooding. 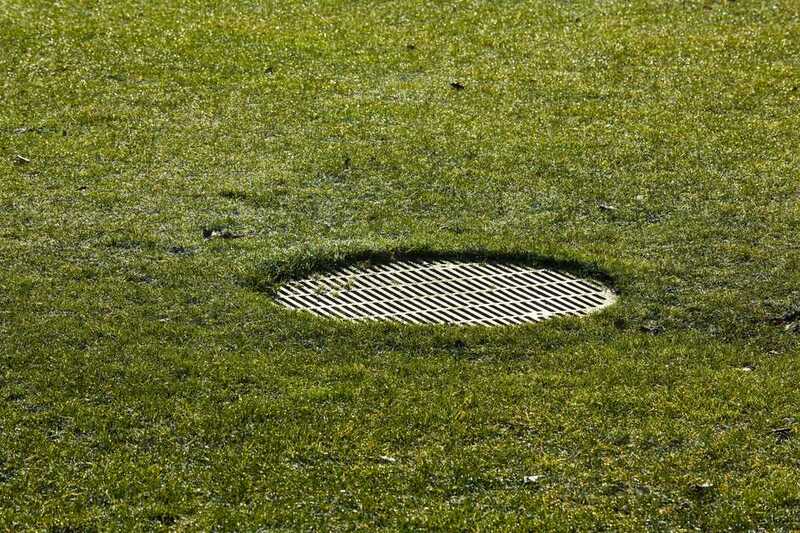 You can identify a yard drain by its telltale grate installed at ground level, usually in a low-lying area of the yard. The structure of a yard drain is very simple: A small underground catch basin covered by a metal or plastic grate catches runoff water, and one or more branch drain pipes carry this collected water to some termination point—often near a street or into a storm drain. Yard drains can also deliver water to a dry well, retaining area, or surface-drainage field. Piping for yard drains may be corrugated plastic tubing with perforations along the bottom that allow some of the water to drain into the soil along the length of the pipe, or it may be rigid plastic pipe without perforations that carry all of the water to the termination point. Fall is the key time for servicing a yard drain, as this is when falling leaves are most likely to clog the pipes. If your roof gutters connect to your yard drain, then you must be sure to clean your gutters before clearing the yard drain system. Remove the cover grate of each yard drain catch basin and clean out any debris you can reach by hand. You can also use a shop vac to reach further into the piping. If the drain branches into multiple directions, clean each branch pipe. Remove anything that does not belong, including rock, dirt, leaves, and trash. Any foreign material can collect inside the pipes and cause water to back up. Check the termination area. This may be on the street (emerging at the curb) or somewhere else in your yard where a slope can safely channel water away. Find this termination point and clean it out. If the drain terminates at a dry-well (a subsurface basin usually filled with gravel or large stones), then lift the top of the well and inspect the basin for debris or excess soil. Remove all material that can cause clogging. Flush the drain piping with water, using a garden hose. Run water down each drain pipe to make sure it is working properly. If possible, snake the running hose down into the pipe to help push out any remaining debris. You can also use multiple hoses to force even more water through the drain. A rubber drain bladder is a rubber bag that attaches to a garden hose and fits tightly into the drain. When the water is turned on, the bag becomes pressurized to seal the pipe, then shoots water out at pressure to dislodge clogs. This is a helpful technique if the water is stopped up or moving very slowly in the area drain. A motorized drain auger is effective at cutting through tough clogs of debris or tree roots. This is the same as a "roto-rooter" tool used to clear sewer drains from the house to the city main. Drain augers have a rotating cable with a cutter head that cuts roots and debris from the inside of the pipe. Most yard drains are 3 or 4 inches in diameter (or larger), so make sure to rent a machine suitable for your pipe size (rental augers typically come with 3-inch and 4-inch cutters). You may need to run the auger from multiple directions, including the termination point. If you're not confident doing this yourself, you can always have a local plumber auger the drain. Jetting: Hydro-jetting, or water-jetting, is the use of high-pressure water to clean out a drain line. This works well when there is a significant buildup of dirt, grease, or sludge. While a drain auger can bore right through the stoppage, it doesn't flush out the debris like a hydro-jet. This is a job for a local plumber. How Much Water Is Your Faucet or Shower Using?